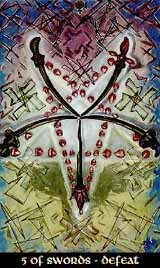 The Five of Swords have reached Geburah, the realm of motion and changing, of destruction and disintegration. The truce of the Four couldn't last, the airy Swords had to recognize that they never were meant for structure and stabilisation, that they needed to stick to their unsteady nature, no matter how high the price might be. The deep crisis the Swords are going through in here also result in the influence of Venus, the planet of emotion, harmony and sensitivity. For the logical Swords who are forced to see everything absolutely clear and unveiled, too much sensitivity can mean a sharp pain that no reasonable argument might soften. Intelligent as they are, they clearly analyse the trap they're in and start struggling against fate, thus recognizing that they cannot win.